Now, with Jacob Zuma out of office and no longer having the ear of anyone, the former Zuma faction is unhinged, rudderless and leaderless. By TLHABANE MOTAUNG. President Cyril Ramaphosa has finally swung the axe of ages, decapitating many Gupta-linked ministers who have sold out our country to the highest bidder, in the process debasing our national pride and undermining its sovereignty. 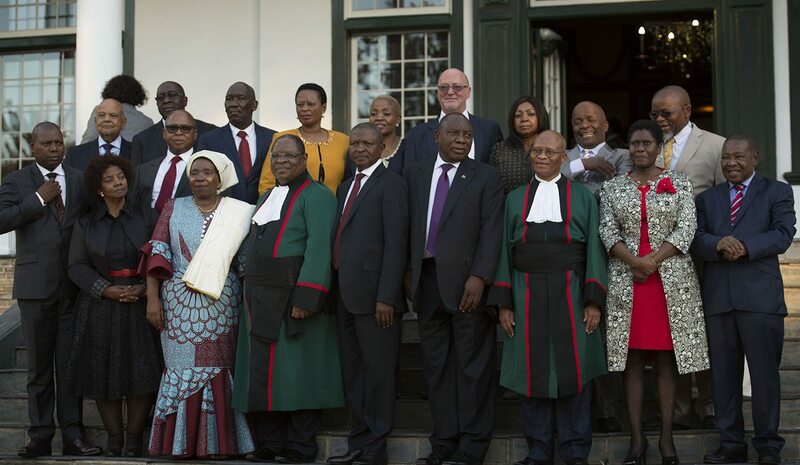 The prospects of a Cabinet reshuffle had seen many a clear-eyed commentator and analyst wondering as to the extent of President Ramaphosa’s power within the African National Congress, given the slight margin with which he edged out his competitor, Dr Nkosazana Dlamini Zuma, in the ANC national elective conference at Nasrec. Yet a closer and long-term look at the state of play within the ANC would show that despite the latent whiff of hostility against Ramaphosa arising from the cloven political space within the party, the pre-Nasrec power configuration is steadily mutating into as yet indeterminate forms. Factions are not free-floating, abstract notions unrooted from concrete material interests personalised by individuals. People who form factions within political parties need a central pole in the form of a strong, commanding figure to hold them together around perceived shared interests, now or in the future. In the case of the pre-Nasrec ANC Jacob Zuma had accomplished just that. But this is an edifice he had gradually but imperceptibly built over a long period of time, beginning with his victory over former President Thabo Mbeki in the 2007 ANC elective conference in Polokwane. Then, there was a great deal of goodwill around the figure of Zuma, who had largely cultivated an image of himself as a victim of the cold, aloof and calculating Mbeki. Zuma had a good reason to manipulate this congenial climate to secure his future. Among others, he was still unsure whether his legal woes would not come back to haunt him. The dropping of 738 charges on a technicality was too close a call for his comfort. But in hindsight one could infer that with the possibility of a Zuma presidency on the horizon Zuma was already being courted by layered networks of scumbags, as well as scruffy and less than pure and noble characters who had calculatedly fancied their chances with him due to his reputed naivety, financial vulnerability and venality. For self-preservation and for the benefits that come with the office of president for which he was smacking his chops in anticipation, Zuma needed to ensure that his position within the party was hermetically sealed, and what better way to accomplish that Herculean task than through building the nucleus of a cultic following embedded in the complex of party leadership with personal benefits from the emerging empire. His survival instincts would not spare state institutions either, in the process turning state and party into two faces of the same coin. Unfortunately for the Zuma faction, their long-term vision of enthralling the party imploded in Nasrec 2017, leaving them flailing in the air without some anchorage. It looks like David Mabuza had his own ideas, which were unbeknown to the faction. In “knifing the plotters in the back”, Mabuza not only paved the way for his ascendancy to the higher reaches of the party but also sundered the core fabric that held the Premier League together and on which any future for the faction depended. Such a fateful move proved a knockout blow which will have marked the beginning of the end for the Premier League faction. Now, with Zuma out of office and no longer having the ear of anyone, the former Zuma faction is unhinged, rudderless and leaderless. While the mist of their historical cause is somewhat still drifting about incoherently, the faction has neither a commanding figure nor a raison d’etre both to preserve and perpetuate itself. What Ace Magashule was saying to the ANC Youth League’s 106 birthday celebrations at the Pietermaritzburg City Hall in January this year was but the desperation of an individual who knows that the jig is up but is too punch-drunk to accept it. Consequently, fears about regrouping of the faction are unfounded. What will amount to a coup de grace for this faction is when both Mabuza and Magashule permanently vacate their seats as chairpersons of their provinces. A provincial support base is the surest way of exerting influence on the national stage, given the importance of numbers in the ANC. It is an open secret that both Mabuza and Magashule (as well as Supra Mahumapelo in North West) were divisive figures in their various provinces and there is no evidence of their preponderant support base, even though they did have some demonstrably significant support. Commanding the levers of state power endears one to many people. Yet it is virtually impossible to separate genuine from fake allegiance under such circumstances. A clear measure of personal allegiance is when an individual wields no demonstrable power that could benefit those close to them. Besides, large swathes of the ANC membership either secretly harboured resentment towards the Premier League provincial leaders or openly defied and challenged them, prompted by their known ethical deformity. All the Premier League leaders had to resort to questionable means to retain their positions, even during the height of Zuma’s influence in the party. It is inconceivable that their surrogates, who are themselves demoralised by the loss of the Zuma faction in the national electoral stakes, will win in a free and fair provincial electoral contest. So once Mabuza and Magashule are replaced by their opposite numbers, they are as good as dead politically. In turn they would be of no political account in terms of the NEC debates beyond what they are capable of as political animals. On the contrary, the newly elected provincial leadership is likely to give them a hard time, mostly as payback for their various political vices and injustices in their former political dominions. Right now, within both the ANC NEC and government, the erstwhile faction members are still trying to find meaning in the face of this staggering political annihilation. In fact, there is nothing in the post-Nasrec scenario to suggest that Dr Nkosazana Dlamini Zuma is or indeed was ever inclined to Zuma’s factionalist agenda. Her reported stance against Zuma’s continued occupation of the Union Buildings in the NEC debates on this issue was no opportunistic streak but a testament to her inner political self. On the other hand, Mabuza has apparently permanently fallen out with his former clique. He is accused of giving them a Judas kiss for his own self-preservation. Given all these, one can safely conclude that the former anti-Ramaphosa faction is speaking in tongues, bewildered and bemused in the face of existential disorientation. Tlhabane Motaung worked as a speechwriter for former President Thabo Mbeki (under political adviser Titus Mafolo), and former President Kgalema Motlanthe (under political adviser Dr Khulu Mbatha); Deputy President Kgalema Motlanthe, and former President Kgalema Motlanthe. He is currently a senior researcher at the Mapungubwe Institute for Strategic Reflection (MISTRA).